How long would a trip from the airport to the railway station take? The journey would take about 22 minutes at peak times and 25 minutes off-peak. The estimated travel time is 19 minutes, plus on average 3 minutes’ waiting at peak times or 6 minutes’ waiting off-peak. The trip is 9.6 km. The vehicle acceleration rate is 1.0 m/s2. The vehicle braking rate is −1.0 m/s2. The average dwell time at stops is 20 s.
The average cruising speed has a big influence on the travel time. 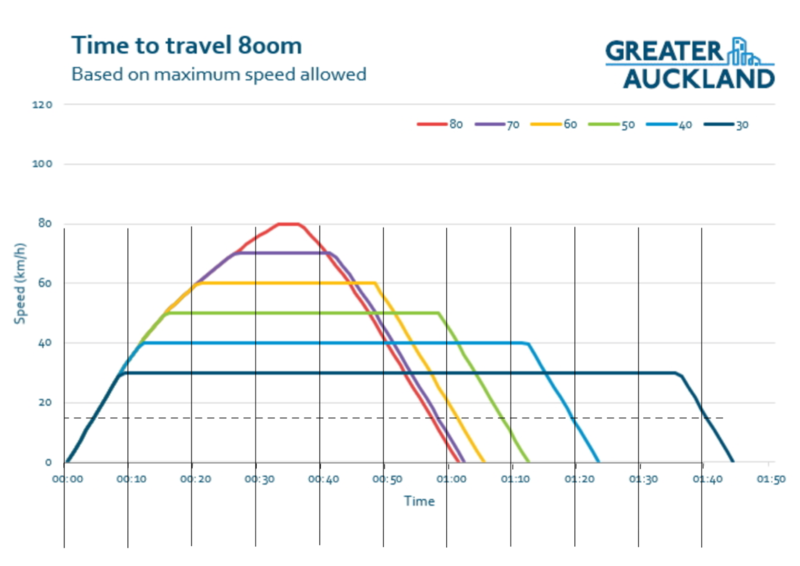 The time to travel 800m between stops is about 65s at 60 kph, 72s at 50 kph, and 83s at 40 kph. For light rail running on-street, cities invest in remodelling the street to allow cruising speeds of 50 kph or more, where it is practical to do so. FIT assumes that Wellington will remodel streets the light rail vehicles run on, to maximize the cruising speed. This means in many cases removing lanes of traffic or parking, restricting turn movements, closing or redesigning intersections, and where possible, widening and improving the pedestrian footpaths. Stops will be located about every 800m, but in reality will be at convenient nodes or logical locations that best fit the fabric of the city. As a first approximation, assume Wellington will remodel the streets so that light rail can achieve an average cruising speed of 50 kph for half the line length and 40 kph for the other half. That is, the overall average cruising speed is 44 kph. This yields an estimated travel time of under 19 minutes. As a second approximation, we estimate the distance and expected average cruising speed for each leg of the route. This also yields an estimated travel time of 19 minutes. During detailed route design it may be feasible to remodel the streets in a way that achieves higher cruising speeds than estimated and hence a shorter travel time. On the other hand, if Wellington decides not to optimize the streets for light rail, the travel time may be longer. Applying the equations of motion to compute the estimated travel time for a journey from the airport to railway station is left as an exercise for the reader.